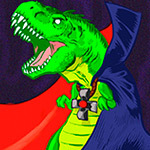 Halloween 2015 - 3/18 - Dinosaur Dracula! The Purple Stuff Podcast: Episode 4! DINO DRAC’S 2015 HALLOWEEN COUNTDOWN.